A quarter that does not sleep neither by day nor by night and that will excite you with its dynamism and beauty, this is the Trastevere. Located in the south of the Vatican City, its winding and tight streets are traversed by crowds of local people and tourists every year. A walk around its stone pavement alleys will take you to discover hidden treasures like some modest medieval churches, little shops with very peculiar objects or just scenes of the quotidian life that will surprise you. What’s more, if you pass by the Piazza della Scala, you will discover a pharmacy of the XVI century that still preserves its ancient furniture, jars and recipes. During the daytime, it is normal to find the most sophisticated locals savouring the best wines. 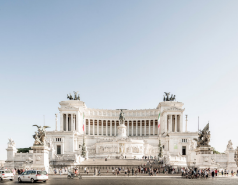 In counterpoint, lots of young people meet around the big fountain located at Piazza di Santa Maria to stand the heat enjoying a delicious ice cream. When the sun goes down, the Trastevere dresses up with Bohemian style. Street artists, poets and a cheerful crowd appear and invade the different restaurants, bars and clubs of the quarter. The Trastevere is an ideal place both for people that look for the relaxed atmosphere of the most traditional taverns and for those who prefer the rhythm of the most modern and innovative bars. Do not miss this charming quarter during your visit to Rome! 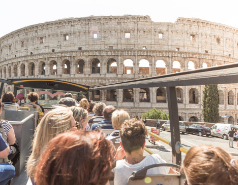 Roma City Tour will take you to visit Rome with its hop-on hop-off tourist bus that goes across the city. 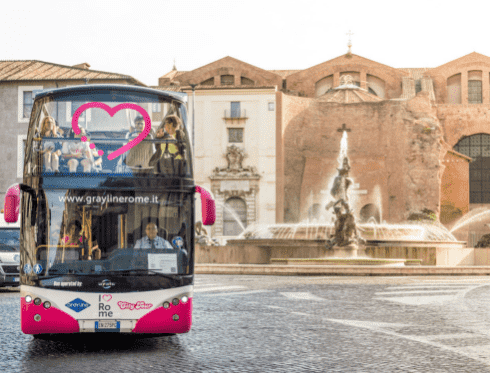 Get off at the stop 6 of our routes Giorni Feriali or Giorni Festivi and access the Trastevere after a walk by the Tiber river.